The Granite Gurus: In celebration of our 100th post, we're doing a GIVEAWAY!!! In celebration of our 100th post, we're doing a GIVEAWAY!!! Today is our 100th post on this blog. Thank you all for reading. Seriously. Thank you. So, to thank you all for reading....and to bring out some of you readers that don't comment, I thought we'd do a little giveaway! We are giving away one set of Teroforma Whisky Stones! Did you read my post about them here? 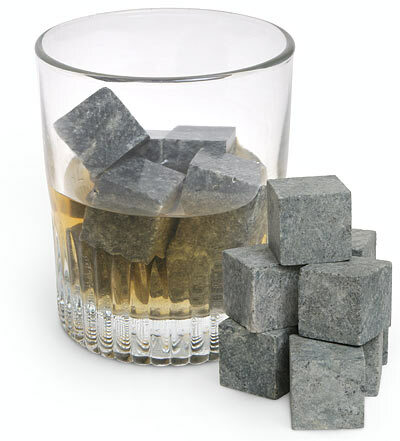 Whisky Stones are made from Vermont Soapstone. Due to soapstone's natural softness (it won’t scratch the glass) and its unique ability to retain temperature for extended periods of time, they are a great substitute for boring ol' ice. Even if you aren't a whiskey drinker I think these would be great in soda or water! You are all eligible to enter three times! 2- 'Like' MGS by Design on Facebook. It's kind of sad, we don't have many friends on Facebook, so we're going to bribe you to like us! After you click that 'Like' button come back here and leave another comment letting me know you did so. 3- Follow us on Twitter. Again, after you do so, come back here and comment letting me know you are following us. *Make sure to leave a separate comment for all three entries! The contest ends this Sunday, June 20th at midnight Mountain Time. I will draw a winner and announce it here on Monday, June 21st. I will mail out the Whisky Stones to the lucky winner later that week. Hmm, I'm a huge fan of the white caesar stone. Looks so clean. I'm in SLC. I really like the white quartz "waterfall" countertops. I also like MGS on Facebook as well. Tremonton, UT. My favorite stone is that white marble. Is it called Carrerra? Anyways, I love it. I also love your blog. The pictures are beautiful. I've been a stalker for awhile, but thought I'd unveil myself for the giveaway! I like mostly dark granite. Absolute black is one that sticks out to me, but after looking at your blog I have really liked some of the white stones and light colored granite. I am from Riverside, UT. I love the green granites. Seafoam Green, Costa Esmeralda, etc. Also, I really like the Delicatus that you wrote about here once. I'll always love carrera marble, but I also like absolute black countertops. I have white cabinets and am looking at upgrading the counters in the next year or so and I constantly flip flop between white and black. I love them both! Oh, and I just started following you on Twitter, too! I found you through Paul Anatar, I'm from Lubbock, TX and I like golden toned granite with lots of swirly movement. I love the way polished granite feels and every day I look at my white formica countertops and miss the kitchen in my last house. Upgrades are down the road aways, but they will definitely include granite! Also found you through Paul Anater. I am having soapstone installed later this summer so these whiskey stones would be the perfect accent! I am in central PA.
PS - I found you via Paul too. My favorite is Duro Minas Soapstone, because it is quite hard (for soapstone) yet has lots of character! It's also a more charcoal-y less-green-y variety, at least for the slabs in my kitchen. Hey, I am Paul Anater and I found you through you! You know what I love, anything subtle and unusual. Calacatta marble, stripey quartzites and sodalite though I cannt imagine a room that could pull that one off. I like seeing black, blue and white sodalite half slabs hanging on a wall as art. I found you through Paul. This is sweet! I love old grey marble tops on the Eastlake furniture I grew up with. You can tell the edges were hand beveled because they're slightly wavy under the fingertips, and very silky. I also bring home stones the size of my hand when I travel, and put them in my garden. Feldspar, granite, vermillion, agate, obsidian...I probably spelled them all wrong, but I love them and know where they came from. I've got an amazing chunk of old black coral from Alaska of all places. I bought that one. My folks have a deep green marble cabinet top that I just love. Bellingham, WA. Volga Blue is neat, I like the contrasts. Omaha, NE. The blog is great. I love pretty much every natural stone, but I'm kind of partial to the granite we have in our kitchen, Brown Cabernet :-) I like that it isn't the typical speckled granite, but has more of a marble look. Following you on Twitter now (I'm @JAXDD). Green in most any stone is my favorite color...but for kitchens, I'd rather a gray - like soapstone. Oh - and I became a fan of your page on Facebook. And I'm from Baton Rouge, LA! This give away is very cool. Pick my favorite? That's hard. I am going with Black Galaxy - we have this on our entertainment center/bar in the Hearth room and the copper flecks in the granite highlight the hand-hammered coppered sink. OH! and I loved that onyx countertop you posted the other day. lovely! Hmm, can only narrow it down to a type of stone- sedimentary. Shale, limestone, slate, sandstone, all exhibit erosion fantastically and i love the visible layers. probably comes from growing up in southern ohio, in the vicinity of such natural wonders as old man's and mammoth caves. also a fan of soapstone for interior residential applications. currently residing in brooklyn, ny, and i heard about you on paul anatar's blog. thanks for the wonderful design contribution- have you thought about contacting the ever-growing community of whiskey-centric bars and restaurants in brooklyn? i am a frequenter of Char No. 4 and i think they may be very interested in this product. ...and i just 'liked' you on facebook. thanks for sponsoring the giveaway! one of my favorite stones is slate. i love the black slate, the green slate, the purple slate.... i love the natural honed beauty and the 'soft feel' and i feel it is durable 'enough' because i like the patina of wear, and feel scratches can be buffed out pretty well.